He won three consecutive classes early in the day. He is Cody Wooten, and I wish I could remember the name of the Wooten family dog his mother is holding on the right! 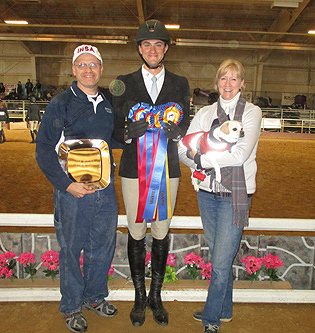 Wooten (center, with his Father on the left) won both individual open classes and team open over fences to start 2016 Zone 3 Zones. Wooten kept his senior year from coming to a halt and helped Centenary College send a full hunter seat team to IHSA Nationals for the eleventh year in a row. Logan Township, NJ - As was the case each of the past three seasons, Centenary College was again high point team at Zone 3 Zones on April 10th. Caroline Norton won both team novice classes while Cody Wooten won team open fences and Carolyn Brouard won team walk-trot to help the Cyclones to 46 points and high point team honors. Delaware Valley University was runner-up for the fourth straight year and again had to rally to overtake Penn State for the honor. Olivia Gardner started the comeback with a win in the fourth team class (intermediate flat) while Kimberly David was a winner in team walk-trot-canter. Delaware Valley riders placed no lower than second over the final five team classes. Early on Penn State looked like they might get back to Nationals for the first time since 2012. Daniella Carissimo bested Wooten in team open flat while Katie Groomes won team intermediate over fences to put the Nittany Lions in first place by an 18-17 margin on Centenary through three team classes. Del Val had but nine points and fourth place overall at that moment before Gardner's win started a gradual climb to second place for the Aggies. Individual Open Equitation On The Flat: 1. Cody Wooten, Centenary College. 2. Daniella Carissimo, Penn State University (State College). 3. Anastasia Bezsylko, Franklin & Marshall College. 4. Shelby Cashman, Centenary College. 5. Sarah Mills, Salisbury University. 6. Vanessa Lempicky, West Chester University. 7. Rebecca Connolly, East Stroudsburg University. 8. Anna Cardelfe, Villanova University. Team Open Equitation Over Fences: 1. Cody Wooten, Centenary College. 2. Abby Johnston, University of Delaware. 3. Daniella Carissimo, Penn State University (State College). 4. Rachel Salera, Delaware Valley University. 5. Nicole Adams, Rutgers University. Individual Open Equitation Over Fences: 1. Cody Wooten, Centenary College. 2. Nicole Adams, Rutgers University. 3. Randi Durkin, Bucks County Community College. 4. Lauren Larkin, DeSales University. 5. Anastasia Bezsylko, Franklin & Marshall College. 6. Daniella Carissimo, Penn State University (State College). 7. Phillip Williamson, Centenary College. 8. Carolyn McBrady, Gettysburg College. 9. Anna Cardelfe, Villanova University. 10. Molly Koch, Salisbury University. Team Open Equitation On The Flat: 1. Daniella Carissimo, Penn State University (State College). 2. Cody Wooten, Centenary College. 3. Abby Johnston, University of Delaware. 4. Sarah Westaway, Rutgers University. 5. Renee Russo, Delaware Valley University. Individual Intermediate Equitation On The Flat: 1. Janessa Capozzolo, Temple University. 2. Grace Harper, Rutgers University. 3. Erin Hurley, Marist College. 4. Casey Norris, Penn State University (State College). 5. Brittany Fleisher, Lebanon Valley College. 6. Renee Russo, Delaware Valley College. 7. Elise Radel, State University of New York at New Paltz. 8. Melissa Fagan, Princeton University. 9. Eryn Linder, University of Delaware. 10. Cara Best, West Chester University. Team Intermediate Equitation Over Fences: 1. Katie Groomes, Penn State University (State College). 2. Skylar Laakso, Centenary College. 3. Allison Bienas, Delaware Valley University. 4. Jenny Schmidt, University of Delaware. 5. Rachel VanDemark, Rutgers University. Individual Intermediate Equitation Over Fences: 1. Brittany Fleisher, Lebanon Valley College. 2. Cheyenne Bianchi, Centenary College. 3. Renee Russo, Delaware Valley University. 4. Janessa Capozzolo, Temple University. 5. Annie Bruno, Stevens Institute of Technology. 6. Grace Harper, Rutgers University. 7. Grace Rothrock, Franklin & Marshall College. 8. Logan Grant, Salisbury University. 9. Jillian Kaufman, Dickinson College. 10. Caroline Griffin, Princeton University. Team Intermediate Equitation On The Flat: 1. Olivia Gardner, Delaware Valley University. 2. Michael Andrade, Centenary College. 3. Sara Echevarria, Penn State University (State College). 4. Rachel VanDemark, Rutgers University. 5. Charlotte Cilio, University of Delaware. Cacchione Cup Class: 1. Daniella Carissimo, Penn State University (State College). 2. Anastasia Bezsylko, Franklin & Marshall College. 3. Carolyn McBrady, Gettysburg College. 4. Anna Cardelfe, Villanova University. 5. Phillip Williamson, Centenary College. 6. Rebecca Connolly, East Stroudsburg University. 7. Abby Johnston, University of Delaware. 8. Randi Durkin, Bucks County Community College. 9. Sarah Pavlini, Lafayette College. 10. Cody Wooten, Centenary College (Editor's Note: This class does Not count towards IHSA Nationals. All five high point open riders were each automatically qualified for Nationals as the riders from their respective regions with the most combined open flat and fences points during the regular season. The runner-up riders in the standings in each of the five Zone 3 Regions are also invited to compete in this division). Alumni Equitation On The Flat: 1. Ashton Phillips, Virginia Intermont College. 2. Jen Armistead, University of Delaware. 3. Emilie Langlosis, Penn State University (State College). 4. Megan Mendenhall, Wilson College. 5. Leigh Rosser, West Chester University. 6. Andrea Jenkins, Kutztown University. 7. Blanton Goll, West Chester University. Individual Walk-Trot Equitation: 1. Emily Weaver, Centenary College. 2. Eugenia Chalbaud - Santeliz, Drexel University. 3. Kelly Paukovits, DeSales University. 4. Amanda Ortiz, Rutgers University. 5. Kelly Hamm, Salisbury University. 6. Breanna Dunn, Delaware Valley University. 7. Asiah Tate, Lycoming College. 8. Danielle Tominus, William Paterson University. 9. Paige Bonneville, Bucks County Community College. 10. Cassandra Watkins, Wilson College. Team Novice Equitation Over Fences: 1. Caroline Norton, Centenary College. 2. Emily Wilmot, Delaware Valley University. 3. Delia Condon, Penn State University (State College). 4. Alyssa Kelly, University of Delaware. 5. Kelly Hogan, Rutgers University. Individual Novice Equitation On The Flat: 1. Andrew Pryslak, Centenary College. 2. Danielle Sagliano, Centenary College. 3. Taylor Ricks, East Stroudsburg University. 4. Olivia Gardner, Delaware Valley University. 5. Izze Kraiman, West Chester University. 6. Melissa Stecklow, Penn State University. 7. Charlotte Cilio, University of Delaware. 8. Elizabeth Mohler, Bucknell University. 9. Tara Kennedy, Bloomsburg University. 10. Holly Dragunas, University of Delaware. She was already headed to Nationals as a Western rider. 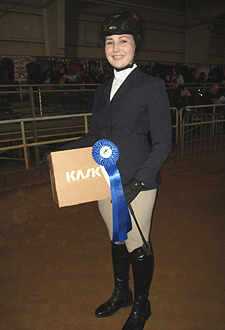 Kimberly David is seen here holding a Kask Helmet she won by placing first in team walk-trot-canter. David had a very good freshman year as the Delaware Valley University English and Western teams were each region champions while David came up with some big rides for both. Her helmet-winning ride at Zones moved the Aggies to within two points of Penn State through six team classes. Team Walk-Trot-Canter Equitation: 1. Kimberly David, Delaware Valley College. 2. Kate Hollenbeck, University of Delaware. 3. Alex Kukorowski, Penn State University (State College). 4. Sveta Kargina, Centenary College. 5. Alyssa Valvano, Rutgers University. Alumni Equitation Over Fences: 1. Megan Mendenhall, Wilson College. 2. Leah Samohous, Delaware Valley University. 3. Carolyn Mulder, Siena College. 4. Caitlin Laughlin, Drexel University. 5. Kristie Swift, Washington College. 6. Andrea Jenkins, Kutztown University. 7. Kelly Jones, Moravian College. Team Walk-Trot Equitation: 1. Carolyn Brouard, Centenary College. 2. Abigail Gess, Delaware Valley University. 3. Rhiannon Long, Rutgers University. 4. Matt Bouldry, Penn State University (State College). 5. Avalon Greene, University of Delaware. Individual Walk-Trot-Canter Equitation: 1. Kelly Quinn, Delaware Valley University. 2. Megan Flaherty, State University of New York at New Paltz. 3. Julia Leeds, Rutgers University. 4. Jen Picinich, Centenary College. 5. K.C. Schweizer, Susquehanna University. 6. Gina Miceli, University of Delaware. 7. Anika Yetsko, Dickinson College. 8. Jenn Nary, Rutgers University. 9. Rachel Rimmele, West Chester University. 10. Emily Stakem, Washington College. Individual Novice Equitation Over Fences: 1. Allison Bienas, Delaware Valley University. 2. Melissa Stecklow, Penn State University (State College). 3. Izze Kraiman, West Chester University. 4. Cirsten Williams, University of Delaware. 5. Elizabeth Mohler, Bucknell University. 6. Rachel VanDemark, Rutgers University. 7. Danielle Sagliano, Centenary College. 8. Justine Cianci, University of Delaware. 9. Ashley Rivera, Bloomsburg University. 10. Karleigh Price, Centenary College. Team Novice Equitation On The Flat: 1. Caroline Norton, Centenary College. 2. Emily Wilmot, Delaware Valley University. 3. Alyssa Kelly, University of Delaware. 4. Kelly Hogan, Rutgers University. 5. Katie Jordan, Penn State University (State College). Final Hunter Seat Team Totals, with the top two teams advancing to IHSA Nationals: Centenary College (2016 Zone Champion) 46; Delaware Valley University (Reserve) 38; Penn State University (State College) 35; University of Delaware 28 and Rutgers University 21.